For the region, see Bavaria (region). 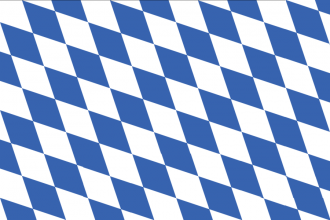 Bavaria is a regional power in Central Europe. It starts small and surrounded by a bunch of even smaller neighbours. It has the advantage of Munich – one of the richest cities in central Europe, but it is smack in the middle of the HRE, so Bavaria needs to tread carefully if it wants to expand. Austria is right next door; Bavaria will need friends. Bavaria also starts with the same dynasty as The Palatinate so if Bavaria plays it's cards right and The Palatinate's allies are rather weak it could be possible to claim the throne of the Palatinate and force them into a Personal union. While not the best military power, the economic bonuses and early bumps to legitimacy and prestige mean that Bavaria is in a good position to keep its head above water financially and diplomatically, if it can stay out of trouble. By mid game, if it has all the national ideas and the Imperial Authority bonus is activated, then it can move to become the ultimate underdog story. Bavaria's missions center around expanding into their immediate vicinity. Have a good strategy for Bavaria? This page was last edited on 20 November 2018, at 00:08.